This was my public declaration of priorities for early fall 2018. Here’s my current one: Now. Advisory portfolio: I love the mix of organizations I’m working with these days, which now includes Before Brands, Ciitizen, Cambia Health Solutions, National Cancer Institute, and Atlas of Caregiving. I also maintain virtual office hours as a mentor for CSweetener and my own network of rebels, upstarts, and action-oriented dreamers. My time is divided pretty evenly between start-ups and legacy companies, playing the role of ambassador and connector. Research: After publishing the overall findings of a national survey of teens and young adults in a 95-page (!) report, I’ve been writing shorter articles about the data related to digital health, peer health advice, and implications for business leaders. The Pew Research Center has given me permission to republish my 2013 opus as an e-book. Please ping if you’ve got tips on how to approach that project: SusannahRFox(at)gmail.com. Next: I’m looking for partners who want to work on a new measure of how U.S. adults are using technology to gather, share, and create health information. I want to both pick up where I left off at the Pew Research Center and expand the scope to include new questions. I’d love to hear from people who have ideas about collaborations and sponsorships for this work. DREAMLAND: The True Tale of America’s Opiate Epidemic, by Sam Quinones. WINNERS TAKE ALL: The Elite Charade of Changing the World, by Anand Giridharadas. “Follow the money” isn’t a maxim limited to political reporters or federal investigators. We should all be aware of who is backing the organizations and movements for which we work or contribute to with our time and attention. My first introduction to the underside of charitable giving was Mark Dowie’s AMERICAN FOUNDATIONS: An Investigative History. Dowie and Giridharadas both point out, essentially, that the master’s tools will never dismantle the master’s house (which is the title of a must-read essay by Audre Lorde). It’s all pretty painful to read since so much of my work has been foundation-funded, but I think it’s better to know than not know. 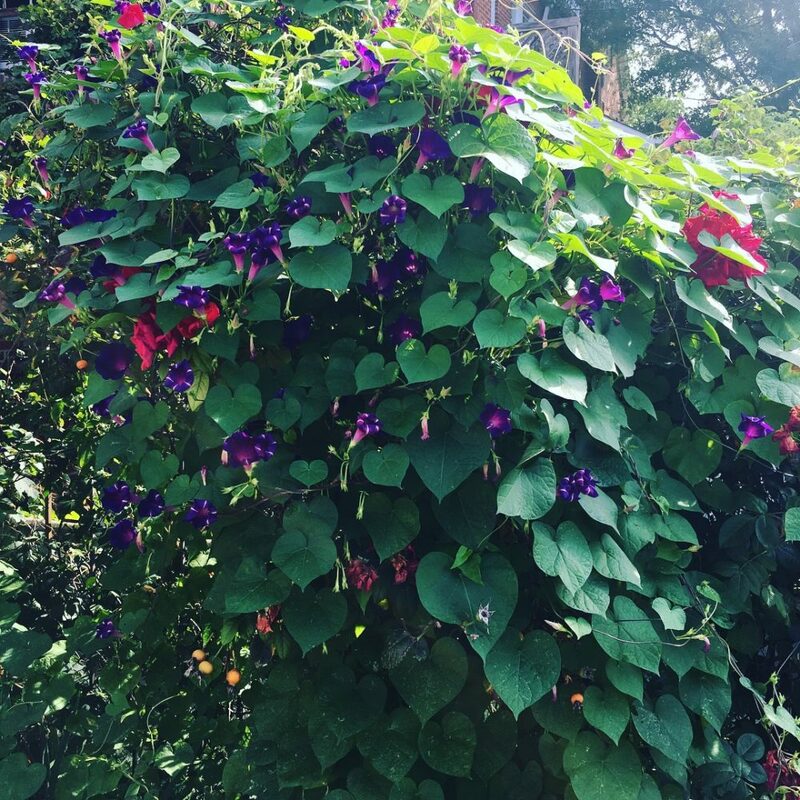 Featured image: Morning glory vine taking over a rose bush, photo and laissez-faire gardening by me because it’s, well, glorious. September is a lush month and this image captures it. Past Now pages: June-August 2018; April-May 2018; Feb-March 2018; January 2018; December 2017; November 2017; September 2017. Inspiration: The /now page movement, by Derek Sivers.